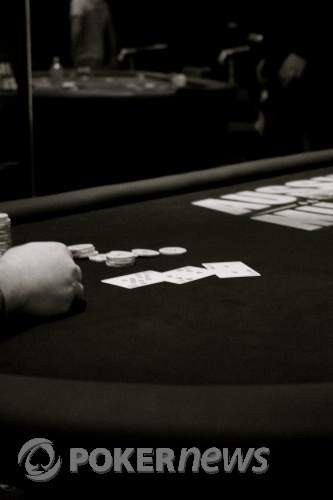 HomeLive ReportingPoker ToursAussie Millions2010 Aussie MillionsEvent 18: $10,500 H.O.R.S.E. David Bach - Winner of the $10,500 H.O.R.S.E. Event! If you were to choose your own fantasy heads-up contest for a H.O.R.S.E. Championship it would be very hard to go past the reigning $50,000 H.O.R.S.E. World Champion and the WSOP Player of the Year. Both David Bach and Jeff Lisandro are mixed game specialists who have both achieved remarkable feats during 2009. After the elimination of Richard Ashby last night, these two warriors battled back and forth for several hours until finally they decided to put the swords away for the evening. To witness these two battle it out heads-up was a treat, so we're glad that the conclusion was rescheduled for this evening, where a throng of fans on the rail got to witness this enthralling match up in the flesh. 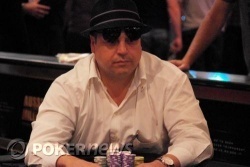 When play resumed David Bach had a solid chip advantage but it appeared as if Jeff Lisandro was going to make a comeback in the early stages as the Hold'em round went his way. However Bach recovered in Omaha and Razz, and the final nail came in Stud, ironically against the world's best Stud player. David Bach has confirmed himself as one of the world's best all-around poker players with another mixed game title and an Aussie Millions Championship Ring to add to his WSOP bracelet. Congratulations David! We're off to Studio 3 to watch the exciting conclusion of the Aussie Millions Main Event. Feel free to join us! David Bach is our $10,500 H.O.R.S.E Champion! The end came during a hand of Stud, with Jeff Lisandro completing the action on third, before Bach raised it up. Lisandro called, and despite Bach pairing up, Lisandro was committed with his short stack. Bach was a long way in front with trip threes when the money went all in on fourth street and Lisandro just couldn't catch up. He's eliminated in 2nd place for $70,200 AUD in prize money. Catching the action on fourth street David Bach checked, allowing Jeff Lisandro to fire a bet, before Bach put in the check-raise. Lisandro called but then gave up when Bach fired again on fifth. Lisandro is now down to under 40,000 chips. Jeff Lisandro's aggressive approach in Razz has come unstuck to see David Bach take a stranglehold on this contest. Catching the action on fifth street, Bach led the betting before check-raising on sixth. Both players checked the river. Bach's ten-low was good to take it down and leave Lisandro with about 50,000 in chips. As David Bach was stacking up his chips into large towers following the hand, and the next cards were dealt, an angry Lisandro snarled, "Just play your hand David," as he appears ready to get this one over with. 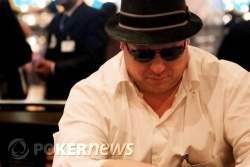 A good Omaha Hi-Lo round for David Bach as he has re-established a big chip lead. We're now on to everyone's favorite game...Razz! While David Bach enjoyed the Omaha Hi-Lo round, he's not going to have an easy time over the next three Stud games - all variations which Jeff Lisandro picked up WSOP bracelets in last year! ...not the words you want to hear in Omaha Hi-Lo. Jeff Lisandro was on the receiving end as David Bach just scooped a pot with on a board of . Lisandro pushed his chips in his opponent's direction and replied, "Nice hand." Jeff Lisandro raised the button and David Bach put in the three-bet. Lisandro called to see a flop of . Bach led out with a bet and Lisandro called. The turn was the and both players checked. The river was the and Bach's river bet was enough to take it down. David Bach appears to be recovering some chips as we enter the Omaha Hi-Lo round. One hand that went to showdown resulted in a chop on an interesting board of . Lisandro check-raised the flop and bet the turn before both players checked down the river. Lisandro collected the low with his as Bach flopped a flush for the high with . 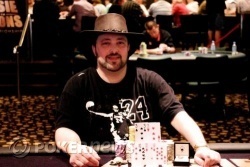 The Hold'em round has been very good to Jeff Lisandro as he won another big pot on the final hand of the round. Lisandro raised the button and then fired bets on every street with David Bach check-calling the whole way. The board read with Lisandro spiking a set of fives on the turn with his to take it down.